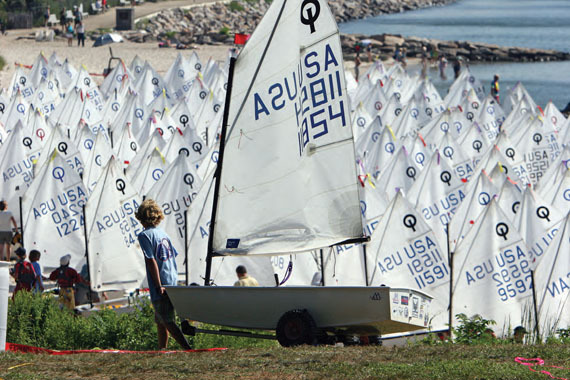 What makes a great Green fleet regatta? That’s a great question and a very important one to the future of our sport. The simple answer is that a great event should inspire a passion for sailboat racing for all competitors. This, of course, is a lot harder to do than it sounds! How do you inspire passion for anything in kids today? I love to tell the story about Phil Mickelson, who at 6 years old was running away from home after dinner…literally dragging his golf clubs to the course for more playing time. Phil learned to swing left-handed by watching his father just having fun. Phil’s father always made a point to stop golfing when Phil had peaked for that day. Whether it was his first made putt, first par, birdie or eagle – right after one of those monumental events happened, Dad would make up an excuse and pull him off the course. The result? If you follow golf, you’ll see a pro who plays at the highest level, fueled by sheer passion and love of what he is doing. How does this relate to running a great Green fleet regatta? The main point is please do not keep the kids on the water too long. The goal is to give the kids just enough racing that they all have fun. Do not wait until two thirds of the fleet are showing signs of getting tired. Get them off the water after just two – or maybe three – very short races, and don’t spend more than two hours on the water. Hopefully, they’ll all be begging for more as you drag them off the water – not relieved that it’s finally over. What can you do with that extra time during the day? Try starting later. Most regattas have registration at 9 am. If the kids have to drive or tow to an event, this often means meeting at the club by 7 or 7:30. Thus, our little kids are getting up at 6 for a really full day. I could argue that sailing in your first Green fleet regatta is harder than taking your driving test. Give kids and parents (who may also be new to this) a break. Have your registration from 10 to 10:30, with half an hour to rig up after that. This really helps kids start the day with a good breakfast and less rushing to get ready. Next, have a fun skippers meeting that involves some games on land. Role play a start with sound signals and marks on land, so kids can get a vision of what they’ll see out on the water. If it’s a big group, break them into smaller ones and run 15 minute “mini clinics” at various stations: quick talks about where the course will be, starts, basic rules, etc. Encourage games where kids will get to know each other and relax a bit. At the same, time host a separate meeting for moms and dads – a “parent clinic,” if you will. Find a few parents whose own kids are older and love sailboat racing. Have them sit down with the Green fleet parents and share stories about how their kids started out. It really helps to hear that we’ve all been through the same things and to understand it’s a normal part of the process. Setting expectations for what Green fleet sailing truly is can go a long way towards making it more fun for participants and parents alike. Do not underestimate the importance of food and water. Isn’t it amazing how much happier kids are after they’ve eaten? Why not feed them before heading out? An 11 o’clock hot pizza lunch on land is a lot better than wet sandwiches on the boat. Keep them drinking lots of water – that really is the fuel in their happy meter tank. If possible, set the racecourse close the club docks. If you cannot, arrange for all coach boats and mark boats to tow strag-glers out. Nothing is worse than adding an extra hour on the water waiting for the last few boats to make it out. Set a really long starting line and a very short course, and talk to the kids at the start. Have a megaphone so the Race Committee can tell them what’s going on, or if they are getting too close to the line too early. Coach all of the kids in the back half of the fleet. This is supposed to be a learning event and fun, so keep that in your coaches’ minds at all times. Then, right when they are all having an absolute blast at the end of a race or two, pull them off the course for the day. In sailing, it’s very easy to tell who finished last, and many young racers do not yet understand that everyone can have a bad race. It’s not a lot of fun to be last at anything, so try to plan something to lift their spirits back at the dock. This is easy at adult regattas … after two hours at the tent party we couldn’t care less about that last bad race. Do something similar for the kids without feeding them rum punch, such as swimming relay races, sock hops, crabbing competitions, etc. Some of the best advice around our club is “reward partici-pation, not results.” If the kids participate enough, the results will come. It’s not fair at this level to single out the top 10 or top three, so don’t do it. These kids are just learning the rules of our sport, so why keep score when the rules are not even understood by all? Keep score if you like so the kids can see how they are improving, but just give them all ice cream – and perhaps a medal – and send them on to the next event. If you do a great job with your regatta, the kids will have many more chances for trophies as they try to run away to their next one…dragging their Optis behind them. Brandon Flack is a former J World instructor, yacht captain, and sailmaker with North Sails. He now owns Atlantic Marketing and represents Musto and Samson Rope in North America. Brandon is the Junior Chair of the Wadawanuck Yacht Club in Stonington, CT, whose Green fleet regatta has grown from 25 to 84 boats in three years. He has two kids in Optis, and loves seeing kids take to the sport of sailing.